dinosaur toes: DIY: let's ruin that dress! do you have clothes in your closet that you just don't wear? or, like me, a stack of clothes so unworn they never make it out of that folded stack on the dryer? if you've been following me on twitter, you probably know i've really been trying to downsize and donate. i have - had, rather - a dress made from really pretty fabric, but i just couldn't wear it any longer. i never, i repeat, NEVER, have a problem with clothes being too tight in the chest, but this dress was, and i can't help but think it was to make IBTC members like me feel a little better about, uh, our smallness. so i decided to shred it up and recycle it! for this project you'll need a dress that you want to ruin (i liked that this one was lightweight, flowy fabric so i knew it would hang nicely without being stiff), scissors, an iron, elastic, a sewing machine, and a friend to keep you company, especially if you're a slow sewer like me. i should have taken a picture before i cut off the top half, but of course i don't think about it until after it's gone. anyway, cut that sucker up! iron out any wrinkles or creases. 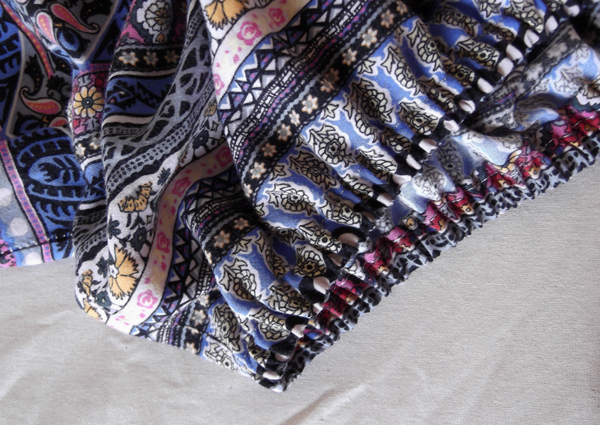 around what will be the waist, fold over a section larger than the width of your elastic. 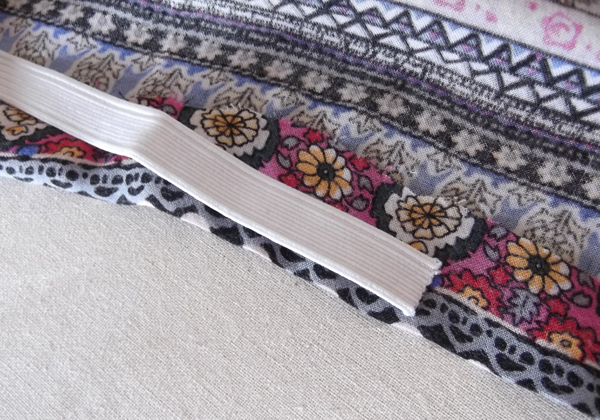 then make one more crease, that way you're elastic is completely hidden in a little pocket with no raw edges. ask a friend for their opinion if you're not sure about what you're doing. or, if things are going smoothly, why not sing together? i suggest something fun like this that one or both of you can dance to should you need a break. i like to get a section of elastic in its little pocket and then pin it so that when i pull it as i sew, it doesn't get lost (because it's frustrating trying to fish it out later). 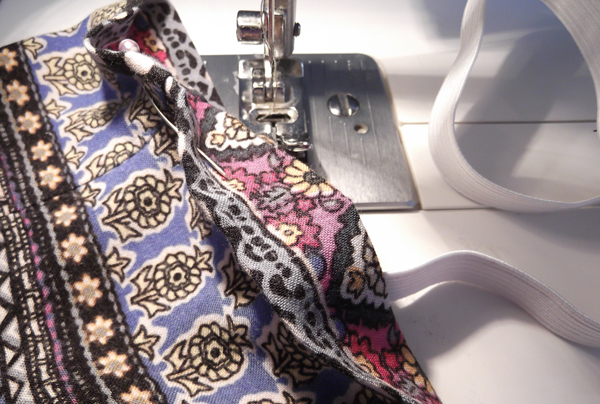 sew, sew, sew, and pull the elastic as you go. when you've sewn just about all the way around, STOP! leave about an inch open so that you can sew the two ends of elastic together, then go ahead and sew the elastic pocket closed. you're finished! and might i suggest - assuming your skirt is printed - that you pair it with another non-matching print? i think it's more fun that way. now when people compliment you on your skirt, or ask you where you got it, you can give a shy smile and say, "this old thing? oh, i made it." do you recycle or remake any of your clothes? if so, what have you made? I've made bags out of old pairs of jeans but that's about it - then again I put in extra triangles of fabric to make my normal jeans extra wide flares but it wasn't quite at the right angle but they worked all the same! impressive! i have yet to do some recycling of my clothes. love this! That skirt is ammmmazing! I have an entire bin of clothes to scrap and reuse...I need to get on that! Thank you so much for the surprise in my package-it totally made me smile gigantically! Oh and who is your little birdy friend! I have a blue parrotlet named Stella! Why is Flojo so adorable? Yeesh. I love your pictures! And what a simple way to revitalize your closet! I should do this more often! you did a fantastic job! i love the title ;D i have a tube top dress that i need to make into a skirt, just need to take out the boning and the zipper and then i can wear it! 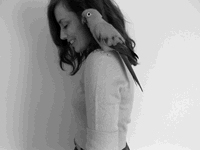 It's nice, but do I have to get a parrot? I was bitten by one once in the tragus and now I'm kind of scared of them. that IS a beautiful print! glad you could save the fabric. your new skirt looks wonderful. I'm forever trying to downsize...this is such a good idea! This is a really cute idea! I've got so many dresses, its a little ridiculous. Maybe converting them to cute little skirts would make them more versatile! Lovely post! 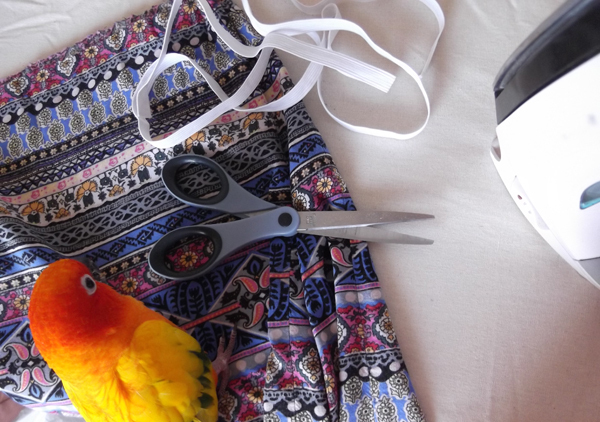 I love lil flo jo so much, gettin involved with the sewing. Oh yes this is superb lets do this please. I've done the exact same thing before! wow I'm impressed! I wish I was more crafty! 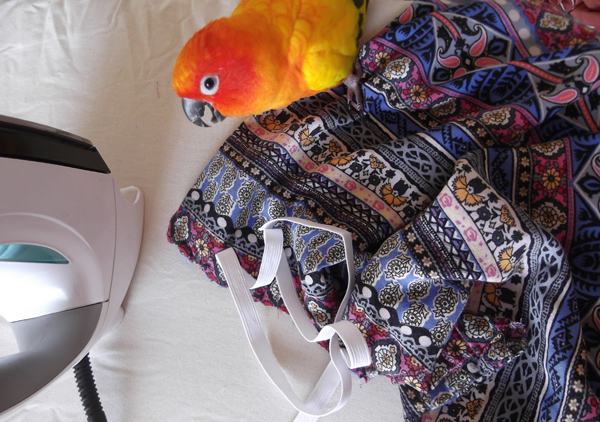 Love your cute little birdie! !